A map showing An Giang province in Vietnam's Mekong River Delta region. A court in Vietnam sentenced five people on Thursday to a total of 19 years in prison on charges of spreading “propaganda against the state” under Article 88 of the country’s Penal Code. The members of the group hung 26 flags emblazoned with three red stripes — the symbol of the Republic of Vietnam, also known as South Vietnam before 1975 — around the town of Chau Doc in southern Vietnam’s An Giang province on April 25. Those sentenced include Nguyen Tan An, 25, who was given five years in prison; Huynh Thi Kim Quyen, 38, sentenced to four years in prison; Nguyen Ngoc Qui, 25, sentenced to four years in prison; and Pham Van Trong, and Nguyen Thanh Binh, both 23, and both sentenced to three years in prison. All are residents of An Giang province. According to the trial panel of the province’s People’s Court, they received the lowest possible sentences under Article 88 because they pleaded guilty. Of the five convicted, Nguyen Tan An was considered the leader for organizing propaganda activities against the state. According to police, An had belonged to other organizations called An Giang Force and An Giang Youth, both of which have a presence on Facebook. An’s Facebook page contains many photos of activities organized by religious groups, such as charity vegetarian meals, and photos of Prophet Huynh Phu So, the founder of Hoa Hao Buddhism in Vietnam. Vietnam’s government officially recognizes the Hoa Hao religion, which has some two million followers across the country, but imposes harsh controls on dissenting Hoa Hao groups such as the one in An Giang province, that do not follow the state-sanctioned branch. Rights groups say that authorities routinely harass followers of the unapproved groups, prohibiting public readings of the Hoa Hao founder’s writings and discouraging worshipers from visiting Hoa Hao pagodas in An Giang and other southern provinces. State media reports have not mentioned Hoa Hao Buddhism in relation to the arrests and prosecution of the five. However, An Giang province and some other parts of the Mekong Delta are centers of the religion, which does not recognize the state's control over its activities. There have been several other cases this year in which Hoa Hao Buddhists have been detained. Hoa Hao Buddhist follower Nguyen Huu Tan, 38, was arrested in May in Binh Minh township of southern Vietnam’s Vinh Long province after police searched his home for “disseminating anti-state documents,” according to a report at the time by the official Thanh Nien news. In far northern Vietnam, police kidnapped the wife of a former prisoner of conscience Vu Duc Hoi after she withdrew 4.5 million dong (U.S. $200) from her bank account and robbed her after three hours of interrogation as to where she had obtained the money. Hoang Thi Tuoi’s abductors identified themselves as officers of the Ministry of Public Security. The Vietnamese civil society group Human Rights Defenders quoted Hoi on Wednesday as saying that the kidnappers had taken his wife to a police station in Huu Lung district, Lang Son province, in far northern Vietnam where they took the money and asked her for information about the person who sent the funds. After nearly three hours, they let her go at 7 p.m., he said. Vi Duc Hoi, a former Communist Party member and former director of the Huu Lung District Party School in Lang Son province, was fired after publicly calling for Vietnam to be a multiparty democratic country. He is also a member of the Association of Former Prisoners of Conscience in Vietnam and one of the founding members of the Association of Independent Journalists in Vietnam. In 2010, Hoi was arrested and sentenced to five years in prison for allegedly spreading “propaganda against the state” under Article 88 of Penal Code. After his release in October 2015, Hoi was closely monitored by local police. Police in the capital Hanoi arrested him again on May 19, 2017, when he arrived there to meet with other activists. He was held for three hours, and then sent back to Huu Lung district. Vietnam’s security forces routinely steal money from the relatives of activists as well as persecute, harass, and intimidate them as a means of deterrence from criticizing the one-party, communist country, the activists say. Nguyen Thi Lanh, wife of imprisoned pro-democracy activist Nguyen Trung Ton, said she was robbed by police in northern Vietnam’s Thanh Hoa province after she withdrew money from a bank, according to Human Rights Defenders. 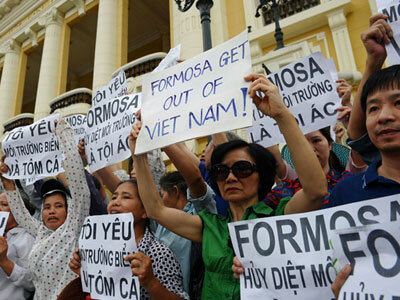 Also on Wednesday, police arrested five people for staging a protest in Ho Chi Minh City against the Taiwan-owned Formosa Plastics Group, which was responsible for a devastating toxic waste spill in 2016, an activist at the scene told RFA’s Vietnamese Service. Activist Dinh Quang Tuyen told RFA that he had witnessed the police and civil defense force beating the roughly 20 demonstrators, many of whom were young or elderly people. Security forces also confiscated their banners and took them away by car. “After that they arrested an elderly person and another man who was recording them,” Tuyen said. Police and security officials at the scene can be seen trying to stop the demonstrators from shouting “Formosa get out,” according to a video clip posted on protester Dung Ngovan’s Facebook account. During the protest, demonstrator Hoang Nhat Minh read out claims about the damage that Formosa had caused in Vietnam’s central provinces and urged people to unite to protect the environment. As of Thursday evening, there was still no information on whether police had released the five protesters they had arrested. RFA contacted the Police Department for the Investigation of Social Order Crimes under the Ho Chi Minh City Police Department, but an official there denied having arrested anyone. The April 2016 spill — Vietnam’s largest environmental disaster to date — killed an estimated 115 tons of fish and left fishermen and tourism industry workers jobless in four central provinces. Formosa acknowledged that it was responsible for the release of toxic chemicals from its massive steel plant located at the deep-water port in Ha Tinh province’s Ky Anh district and voluntarily paid U.S. $500 million to clean up and compensate those affected by the spill. Slow and uneven payouts of the funds by the Vietnamese government, however, have prompted many protests. Reported by RFA’s Vietnamese Service. Translated by Emily Peyman. Written in English by Roseanne Gerin. Do you goons understand why the VNCH Republic still in the hearts and minds of the people – even young people that born after 1975? Because they yearn and understand about freedom, rights, education, and economic opportunities. Those things were possible under VNCH Republic that flew the yellow flag with 3 red stripes! You know about the yellow background, the 3 red stripes are the Union of VN 3 regions –that included you goons up North. We always recognized the Northern region as family – as a brothers and sisters. But, you goons were taught differently by Ho’s goons and communist propaganda. You pushed that bloody thorny crown upon the brows of millions so to complete the visions of foreigners from China and Russia. You goons are true puppets to Russia and China with your red flag, and star – At time, even hammer and sickle. Why subjected yourselves under another nation or another race? What’s wrong about being Vietnamese? Aren’t you proud of VN history and its races? Rule ourselves, advance our people, and protect our lands – those were our ancestors intention. Do that and you’ll see less unhappiness and headaches.